A note to our readers: In an effort to combine the online interpretive efforts of the USS Constitution Museum this will be the last week Log Lines can be accessed from this address. In the future, please direct your browsers to https://ussconstitutionmuseum.org/log-lines Those who follow us by e-mail will continue to receive the newest post. Next week, visitors to this site will be redirected to the new one. Thanks very much for your continuing interest in the latest in research and collections at the USS Constitution Museum! In 1848 Europe was in turmoil. Revolutionaries in Germany, France, the Netherlands, Italy, and the Austro-Hungarian Empire fought to establish constitutional democracies and limit the powers of monarchs and the nobility. Worried that the uprisings would endanger American commercial interests in the region, the US Navy augmented the Mediterranean Squadron. Constitution sailed for the Mediterranean in December 1848 under the command of Captain John Gwinn. The squadron commander, Charles W. Morgan (who had served as a lieutenant in Constitution during the battles with HMS Guerriere and HMS Java in 1812), received orders to remain strictly neutral in the European conflicts. The squadron would assist Americans in distress, but it would do nothing to aid the warring factions in their bid for power. Constitution made a quick passage across the Atlantic and anchored off Tripoli on January 19, 1849, where Consul Daniel McCauley and his entourage came on board for transport to Alexandria, Egypt. After discharging the consul, the ship made her way back to the west coast of Italy, and spent the next five months shifting her anchorage between La Spezia, the new US naval repair depot, Leghorn (Livorno), and Naples. On August 2, 1849, Captain Gwinn anchored the ship in the broad bay before Gaeta, a town just north of Naples. His professed reason for the visit was to call upon Pope Pius IX. In November of the previous year, the Minister of Justice of the Papal States had been assassinated. The next day, the people of Rome took to the streets demanding a variety of social reforms, democratic government, and an immediate declaration of war against the Austrian Empire (which at that point occupied much of Italy). 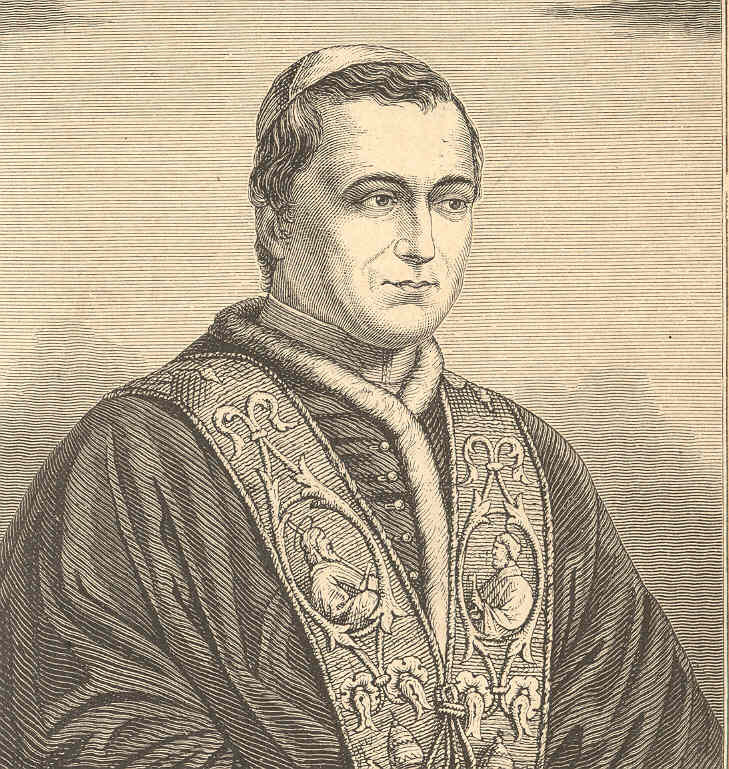 The following week, Pope Pius slipped out of Rome disguised as a country priest and took up residence at Gaeta, where Ferdinand, King of the Two Sicilies, had a powerful stronghold. Secure from the reaches of the democratic revolutionaries, the Pope set about to win back the Papal States, going so far as to issue threats of excommunication to those engaged in liberal political actions. A portrait of Pope Pius IX, soon after his election in 1846. 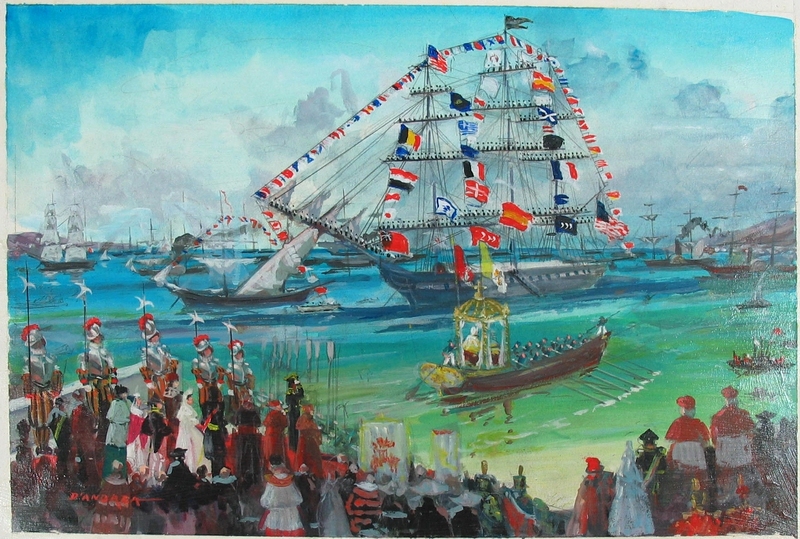 A somewhat fanciful depiction of the Pope’s visit to Constitution by Chet D’Andrea, 1991. USS Constitution Museum collection. In a letter to his wife, Capt. Gwinn explained that the Catholics on board had been blessed by the Pope on the gundeck, and that he had distributed rosaries to the faithful. Gwinn himself received a picture of Pius. The officer of the watch during the visit was Lt. Benjamin Franklin Shattuck of Portsmouth, New Hampshire, and he received a rosary which is now on display at this museum. 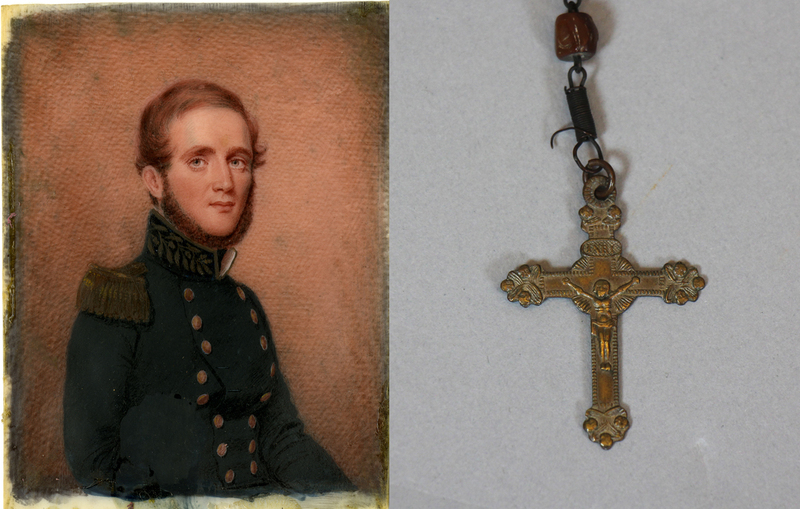 A miniature portrait of Lt. Benjamin F. Shattuck by Alvan Clark, and a detail of the rosary given by Pope Pius. USS Constitution Museum, courtesy of the Curator of the Navy. Since my departure from Naples, I have learnt, to my deep surprise, and regret, that he did not go to Messina, as I ordered, but that he went to Gaeta, where he received on board, and entertained, the Pope, with his attending Cardinals, and the King of Naples &c &c. The Department will readily perceive that when the peculiar position of the Pope, at that time, is considered, this act of Captain Gwinn places the United States in an attitude which, if I understand the views of the Executive, and the general policies of my country, correctly, is, to say the least, extremely embarrassing and painful. Upon meeting him, I shall certainly require explanations of his conduct, which I sincerely trust may be satisfactory. My personal relations with him have always been most friendly, but I conceive that I should fail in my duty, if I passed over, unnoticed, conduct so very imprudent, and entirely subversive of discipline. What Morgan didn’t know, as he sat writing on September 4 in his cabin on board the frigate Mississippi, was that Captain Gwinn had just died of chronic gastritis in a hotel in Palermo, Sicily. His actions were duly censured, but by then he was far beyond the reach of an earthly court martial. Pope Pius eventually returned to the Vatican in 1850 with the help of the French Army. He lived until February 1878, making him the longest-lived elected pope in Papal history. He lived long enough, in fact, to see the Papal States once and for all subsumed by the Kingdom of Italy in 1870. It should be noted that in 1837, Captain Jesse Duncan Elliott of Constitution visited Rome and invited the Pope to visit the ship. The Pope declined the invitation, but sent Elliott a medal with his likeness. Elliott said he would forward the medal to the State Department.